When Fred Gooding started his roofing business in 1946, there was only one choice for low-sloped roofs, and that was the built-up roof (BUR). Today, BURs can be hot-mopped or cold-applied, gravel-surfaced or smooth-coated, traditional or modified bitumen. GSM Roofing can partner with you to expertly install this durable and time-tested roof type. The best feature of a built-up roof system is redundancy. This roof type is “built up” with several layers of plys, with each layer providing protection if another layer gets damaged. And although BURs aren’t as popular today as they once were, they are still a viable option when selecting a new roof. 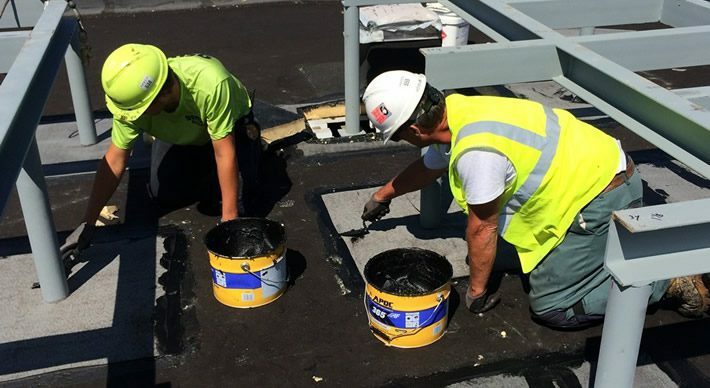 Ready to talk about your next built-up roof project?